Do you know the many uses for old light bulbs or the correct way to recycle CFL bulbs? Instead of tossing those old light bulbs, get crafty with them! Smart, CFL and LED light bulbs are all the rage, especially if you’re trying to save on energy costs. But what do you do with the halogen bulbs once they’re replaced? Are there any actual uses for old light bulbs? Sure there are! If you’re feeling crafty, hollow out those bulbs and take a shot at one (or six!) 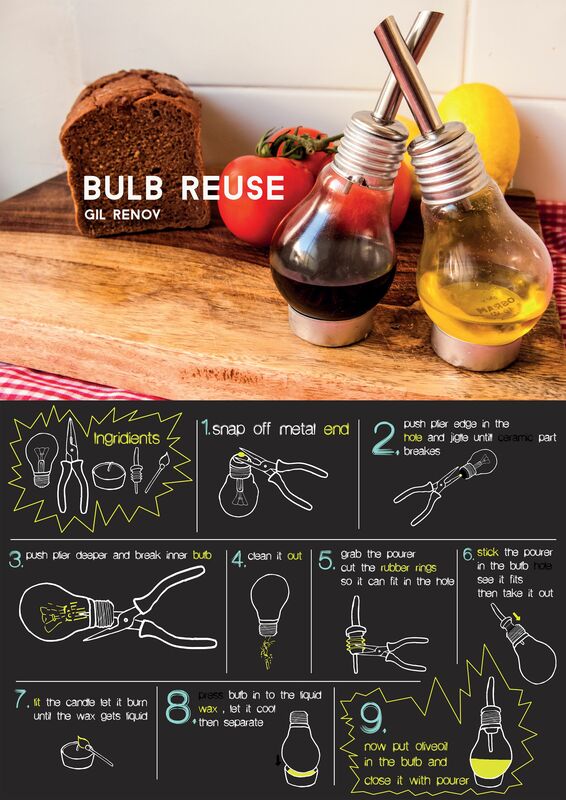 of these creative projects that are all about how to reuse old light bulbs. Industrial accents are the hot ticket in home design right now. Why not create your own decorative yet sturdy and functional hook accent using a light bulb as a mold? Find all the details to make a concrete light bulb hook here. Add to the attractiveness of your flower cuttings with this simple, elegant vase project. The best part? Your out-of-pocket total will likely be less than $5 per vase! Check out all the ways to showcase those blooms here. AHS Lightbulb Moment! Did you know there’s a correct way to recycle CFL light bulbs — that doesn’t include tossing them in the trash can? According to the Environmental Protection Agency, you should recycle them at/using waste collection agencies, local retailers or mail-back services. Recycling them not only prevents the release of mercury into the environment; it also enables other materials in the bulbs to get reused. For all the details, visit search.Earth911.com. Get the kids involved with these oh-so-adorable light bulb hot air balloons! Birthday party decorations? School art project? Rainy-day indoor activity? They’re fun anytime! Want to show off your creative side everywhere you go? Make these repurposed bulb necklaces in just a few easy steps! Bonus Tip: For an extra unique look, use bulbs that have burned out and have the smoky look around the glass. Tired of tossing those holiday lights every year that won’t work anymore? Collect them, instead, to make a beautiful wreath. All you need is a wreath form and a little glue — no electricity required! Find some inspiration here. Light bulbs plus tea lights plus bottle toppers — all you need for some oil and vinegar bottle drizzlers that guests will be talking about long after the party’s over! Find the instructions for these bottle drizzlers here. Want more genius DIY ideas? Check out these 10 home hacks for every room in your house.